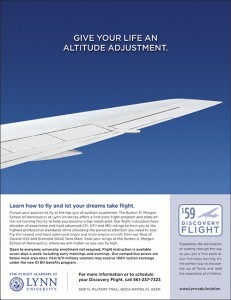 Lynn University is no longer flying solo after recently engaging MDG Advertising to take their image to new heights. One of the first projects we landed was for their Burton D. Morgan School of Aeronautics. This top gun of aviation academies offers a first-class flight program and top-notch training facility that gives a whole new meaning to higher education. Since their advanced instruction is open to everyone, with no university enrollment required, we took off to develop creative that expressed how everyone can earn their wings at Lynn. Our first ad takes aim at students enrolled at Lynn and those attending high schools and other local colleges who are looking for a flight school where they can personally and professionally soar. Our next ad steers non-students toward the flight academy by making it clear that Lynn flies high above other flight schools by offering the area’s top instruction with the most convenient hours and competitive prices. Finally, we change our flight pattern with a direct mail piece aimed at non-students looking to land a better career, as well as professionals seeking some fly-flying fun or whose lifelong dream is to learn to fly. We explain how Lynn can make their dreams take flight through a first-class program that’s second to none. 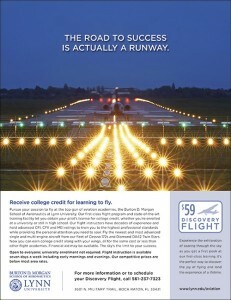 For more information, jet over to www.lynn.edu or call 561-237-7323.